A newspaper report about Freud’s arrival in Britain. Copyright Freud Museum London. 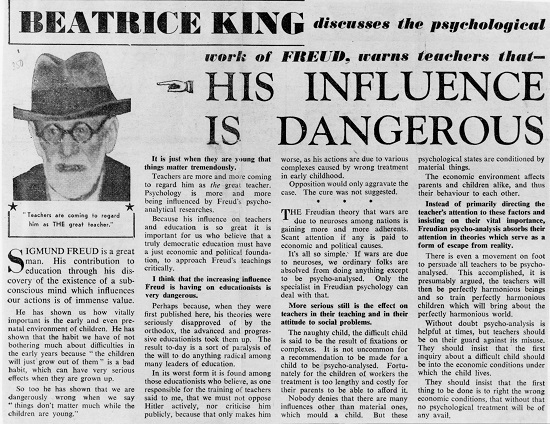 We have teamed up again with the Freud Museum in London to get you writing about that most resonant and influential of subjects – the unconscious. 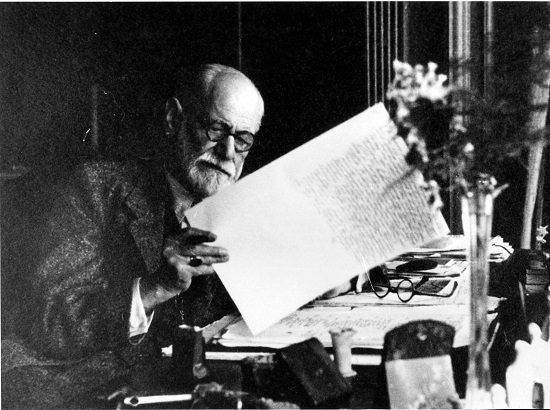 This mini writing competition is be part of a Festival of the Unconscious to be held at The Freud Museum from June to September 2015, which celebrates the centenary of the publication of Freud’s seminal paper on the subject. The Museum will select some of your poems to be included in the Festival; winning poems will also be published on Young Poets Network and receive prizes from the Museum gift shop. The Freud Museum is located in the house in which Freud spent the last year of his life after escaping Nazi-occupied Vienna in 1938. His daughter Anna Freud lived there until 1982. The heart of the house is the study and consulting room, where his antiquities collection and library were set up for him in much the same fashion as in Vienna, including the famous psychoanalytic couch. Much of our behaviour is performed ‘unconsciously’. In fact, if we were conscious of everything we did, our lives would become impossible. Imagine walking down a flight of stairs while being conscious of every step! What Freud introduced was the notion of a ‘dynamic unconscious’, a part of the mind that is hidden from our conscious awareness but which is continuously motivating our behaviour. We laugh at a joke, but we don’t know why. Thoughts come into our head, but we don’t know where they come from. We repeat patterns of self-destructive behaviour, or plague ourselves with irrational fears. It is as if we carry within us our own ‘subtext’ – everything we do has more than one meaning. Freud argued that the unconscious was created in childhood and consisted of urges, thoughts, feelings, memories, and experiences that have been ‘repressed’ from consciousness. The unconscious is where the ideas associated with forbidden wishes and unacceptable thoughts get ‘put away’. But, for Freud, they are always trying to express themselves – in dreams, in ‘Freudian slips’, in ideas coming unbidden into one’s head, in psychological symptoms. Freud said that the discovery of the unconscious means that we are no longer ‘masters in our own house’ – we literally do not really know who we are! Throughout his life, Freud was interested in literature. He wrote both about authors and texts (Shakespeare, Ibsen, Dostoevsky, Greek theatre) and the very act of writing in his paper Creative Writers and Day-Dreaming, with a view to uncovering the unconscious desires and conflicts which lie within written texts themselves. The poet A.E. Housman wrote, in 1933, that “Meaning is of the intellect, poetry is not”, and went on to elaborate that “the intellect is not the fount of poetry… it may actually hinder its production”. Perhaps this suggests why poetry is such an effective tool for engaging with the unconscious both as reader and writer, because a poem cannot be read in one way and given a definitive interpretation, but is open to many different readings. In poetry, the ‘tyranny of the intellect’ is held at bay. This is what Freud was getting at when he said that poets and philosophers were the first discoverers of the unconscious. Many poets and writers have attempted to get around the ‘tyranny of the intellect’: Surrealists such as Andre Breton attempted to express the workings of the unconscious through automatic writing and dream symbolism; and novelists such as Virginia Woolf (who Freud knew) wrote stream of consciousness novels. Ted Hughes’s poem ‘The Thought Fox’ is in some ways a description of how unconscious thoughts enter the mind to form the poem. It traces the path of poetic creation: the poet “imagines this midnight moment’s forest” where “Something else is alive”, then in the final act “The page is printed”. Freud at his desk. Copyright Freud Museum London. There is now much support for many of Freud’s hypotheses from modern neuro-science, and much stimulation of neuro-scientific research by ideas of psychoanalysis. But Freud’s influence in the 20th and 21st centuries also extends far beyond his specific psychoanalytic theories. He is rightly said to have created a whole “climate of opinion”, as the poet WH Auden wrote after his death. He provided a new way of looking at the world which entailed the investigation of hidden motives in psychical and social events. He put on a scientific footing the idea commonly expressed (famously by William Wordsworth and Gerard Manley Hopkins) that “the child is father to the man”. He undermined any definite distinction between ‘normal’ and ‘pathological’ behaviour (we are all a bit neurotic) and by doing so opened the way for an attitude of greater tolerance towards those we consider ‘different’. Though often denounced as a ‘new religion’, the legacy which Freud bequeathed is still the subject of lively and controversial discussion. We would like you to write a poem about the unconscious. You could try automatic writing or stream of consciousness writing. You could write about the symbolism of dreams. You could write in the voice of Freud, trying to dig deeper into the human brain. You could write in the voice of the unconscious itself – what is its tone and what does it have to say? For further information about the Museum, you can download the museum leaflet in various languages from the Museum website (under ‘Guide books and leaflets’). You can also access further information and links to the collection and archive. If you live in London or are planning a visit, you can experience Freud’s extraordinary study for yourself. If you’d like to research your poem by visiting the museum and chatting to a specialist, please contact Ivan Ward on ivan@freud.org.uk. I am confused whether this poem is about the your unconscious or subconscious ?? Hi Millie, good question – we weren’t sure of the difference either! But we just did a little research and apparently the subconscious is not a Freudian idea. You might like to check out this Wikipedia article: http://en.wikipedia.org/wiki/Subconscious. So the competition is to write about the unconscious. Good luck! hello,am new here,how can I submit please? Hi Ilhem, welcome! If you have a look at the ‘Submitting your poems’ section towards the bottom of this web page, you’ll see all the details about how to submit. We look forward to receiving your poem! Can we write in our own voice experiencing the unconsciou? Hi Adeena, yes that’s fine – anything to do with the theme of the unconscious! I have submitted a poem for the competition. When will I find out the results? Hi Samuel, we will let everyone know within the next couple of weeks.